The life of a cowboy is rich with tradition and heritage. Traditions and brands are passed on and the legacy of a cowboy lives on through each generation as the sun rises and sets on the beautiful ranch called home. A cowboy is defined by more than wearing boots and a cowboy hat. It is about respect for the land, for cattle and horses and, of course, for those who toiled through the hot dry sun before you. The Legacy of a cowboy is about passing on knowledge, passion, dedication, courage and character. Tavaputs Ranch sets a standard of stewardship that can be used as an example for future generations. We are honored to have received the Alpo Leapold Award in 2009. Honored for excellent stewardship of the land. We also received the prestigious ESAP Environmental Stewardship Award from the National Cattlemen in 2010. Our motto is to protect the environment, all natural resources and wildlife along with continuing our cattle ranching legacy for the past 120+ years here on the West Tavaputs Plateau. 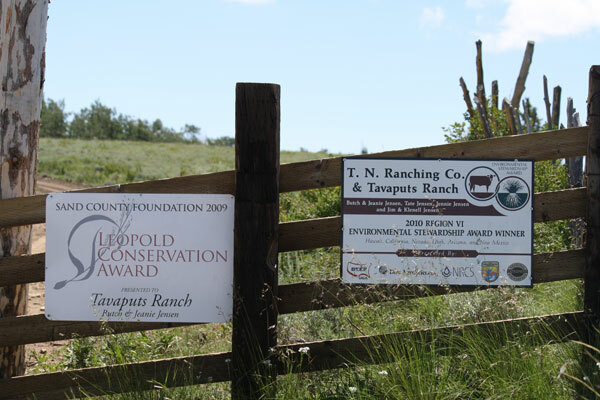 2009's prestigious Leopold Conservation Award was given to Tavaputs Ranch and the TN Ranching Company. We are honored to accept this award and express our gratitude to the good folks at the Sand County Foundation. The landscape of any Ranch is the owner's portrait of himself. Conservation implies self-expression in that landscape.